I put this is my formal living room. Compliments my decor very well. Different. Adds a unique twist. Add stunning elegance to any room in your home with this dazzling 4-light crystal chandelier. 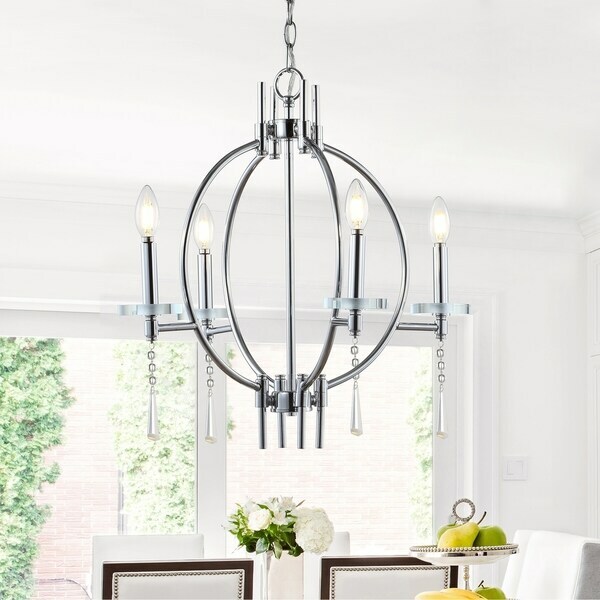 Chandelier lights glow surrounding a chrome orb, while crystal accents cascade light in all directions. This design would be a focal accent in a dining room, or would add elegance to the master bathroom. Dimensions 23.0 In. X 23.0 In. X 98.0 In. It’s clean modern and elegant. I am slowly changing my decor to a more modern flare but keeping it elegant. Using in the dinning room above 90 inch round wood with chrome trim and legs.